What a remarkable 2018! Over the course of the year, I had the extraordinary opportunity to serve as board president, a transformational leadership role unique to the real needs and hardships that Marion County faces. With the help of a strong and uniquely talented board, guidance of Brett White and the tireless presence of community volunteers, we have been able to implement change, encourage program growth and HELP the men, women and children of our community… for all of this - THANK YOU! You may be asking yourself, how did we do it? We did it because you became the ONE! You all become the ones to HELP, to love, to care for and be concerned about the United Way and the people, programs and possibilities in Marion County. A very special thank you to Tina Shaw, campaign chairwoman, for helping us successfully reach our campaign goals and raise in excess of $500,000. Tina truly embraced her role and gave of her time and talents without reservation. As we look to 2019, I would like to wish Pat and Amy Snively well in continuing the momentum needed to ensure the financial and organizational stability of the United Way of Marion County. I challenge you to continue to forge new relationships and respond when Marion County calls… after all it only takes you becoming the ONE! As my time as president ends, I’m filled with gratitude and pride to know that the vision and determination of volunteers resulted in a historic campaign and changed the trajectory of Marion County. I am also filled with anticipation for what the future holds – I assure you that Sally Morgan and the board will be working to meet and exceed your expectations to achieve positive outcomes for our agencies and those impacted. Continued blessings and love in 2019! This year has been a year of transformation for our United Way. Under the leadership of our Campaign Chair Tina Shaw and the generosity of a record 1,051 donors, we exceeded our campaign goal by over $35,000 and raised more than $510,425. This is the first time our campaign has raised over half-a-million dollars. In a year that has proven trying for so many nonprofits across our state, our success is a true testament to the hard work of our donors, volunteers, and Board of Directors. We dedicated a significant amount of time to solidifying our relationships with corporate partners and our funded partners. Fairmont State University had their largest campaign ever and we began our new Emerging Leaders program. We launched our Warm Coats Warm Hearts collection and collected over 2,000 items for individuals in need. Our MyFreeTaxes program helped families in Marion County save over $23,000 on tax preparation fees. We made significant strides in becoming a more financially stable organization. Through the generosity of several estate gifts, we’re in a very strong financial position for the future. We’ve accomplished a tremendous amount this year, but we still have much work to be done. While we wrap-up this year of transformation, I’m looking forward to 2019 being a year of reinvention. We must reinvent the way Marion County sees our agency and help them understand the importance of our work. It will take all of us doing our part…after all, we are better together! 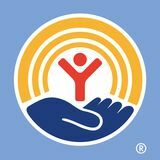 United Way fights for the health, education, and financial stability of every person in Marion County. Impact Programs Empty Bowls The fifth annual Empty Bowls Soup and Bread Luncheon was held on March 11th at the Knights of Columbus. The event was the largest one yet and raised nearly $7,000 for the Soup Opera, Connecting Link, and Salvation Army. Over 500 people attended and enjoyed a meal and education about hunger in our community. Each attendee took home a handcrafted bowl that was donated by local artisans and businesses. All the soup, desserts, and bowls were donated by generous individuals and businesses in our community. The event is a true community collaboration. MyFreeTaxes United Way Worldwide partners with industry leader H&R Block to help people easily and accurately file both their federal and state taxes through MyFreeTaxes. MyFreeTaxes is mobile optimized so anyone can access MyFreeTaxes.com from their computer, tablet or smart phone. Most filers complete their taxes in less than an hour. The program is completely free for individuals making less than $66,500. This was the first year that Marion County promoted the program. We jumped from number twenty-three in West Virginia up to number four. We had over 123 tax returns completed, which helped save families over $23,600 in tax preparation fees. Volunteer Marion In April, we launched Volunteer Marion, an online portal dedicated to helping individuals and organizations find meaningful volunteer opportunities online. The system allows agencies to post opportunities and volunteers to respond completely automated. This new system has already dramatically changed the way Marion County volunteers. We have 43 organizations registered in the system and over 397 active volunteers. Itâ&#x20AC;&#x2122;s easy to get involved. Just visit volunteermarion.org. Total Raised: $34,600 Celebration of Lights The Celebration of Lights celebrated its 11th year in 2018 with a record-setting year. Our United Way is fortunate to partner with the Rotary Club of South Fairmont for this holiday tradition. Their hard work is truly amazing. Over 455 displays line the park, with approximately 20 of them added this year. Over 6,351 cars and 24,586 people traveled through the displays this year. Market in the Park welcomed over 2,000 individuals as the soft opening of the season and 125 brave individuals participated in the Reindeer Run 5K. Total Raised: $62,500 Day of Action On June 21st, we joined with other United Way organizations from around the globe for Day of Action. This was our first large scale volunteer event in Marion County. The special day was sponsored by Rogers Electric. Volunteers were treated to lunch at beautiful Palatine Park and received commemorative t-shirts. Once they had lunch, over 121 volunteers spread out across Marion County to complete over 18 service projects. The event takes place on the first day of Summer each year. Directors from the Funded Partners proudly raise the numbers to reveal the total amount raised during the campaign celebration. Members of the East Fairmont High School Drumline also joined as a surprise guest to help unveil the record amount. The Emerging Leaders program connects young leaders with United Way and immerses them in the community. The mission is to bring together a diverse group of individuals between the ages of 20 and 40 to make a difference. The United Way of Marion County Leadership Giving Society recognizes and celebrates the vital importance of personal giving at exceptional levels. Members of our Leadership Giving Society are people of vision. Their community involvement creates solutions that shape tomorrow. 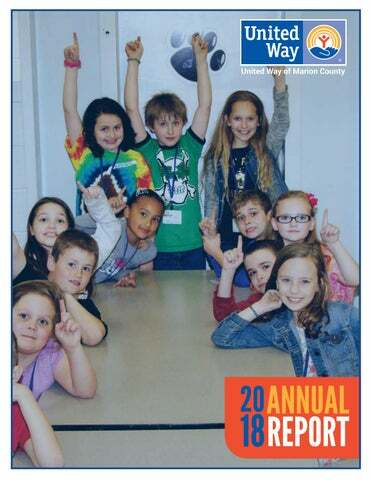 2018 Annual Report of the United Way of Marion County in Fairmont, West Virginia.